Welcome to our weekly look at potential breakout players based on fantasy points per opportunity. As usual, this article will seek out players who have been making the most of their opportunities, and opponents who have been giving up a ton of fantasy points per opportunity. PPO is a fantastic stat to use for identifying potential blowup spots for fantasy players. We highlighted Michael Crabtree in this space last week, and, naturally, Amari Cooper went off. It was the right process, but the wrong application. But getting the process right is the most important thing, so we’ll keep drawing from the well. This could be Joe Mixon’s breakout week. He draws the Colts, who have given up 0.76 PPO to running backs on the ground, tops in the NFL. Mixon’s own PPO (0.27) ranks toward the bottom of the league, but he did flash big-play potential last week, gaining 6.9 YPC. He’ll need more than seven attempts do to damage, but if it’s going to happen at all this year, it needs to happen this week. Baltimore has been only slightly below average in terms of PPO given up to running backs, but if we look at just Weeks 3-7, they have been gashed on the ground, giving up over 150 yards to enemy backfields in four of their past six games. Look for Jay Ajayi to rebound in a big way on Thursday night. 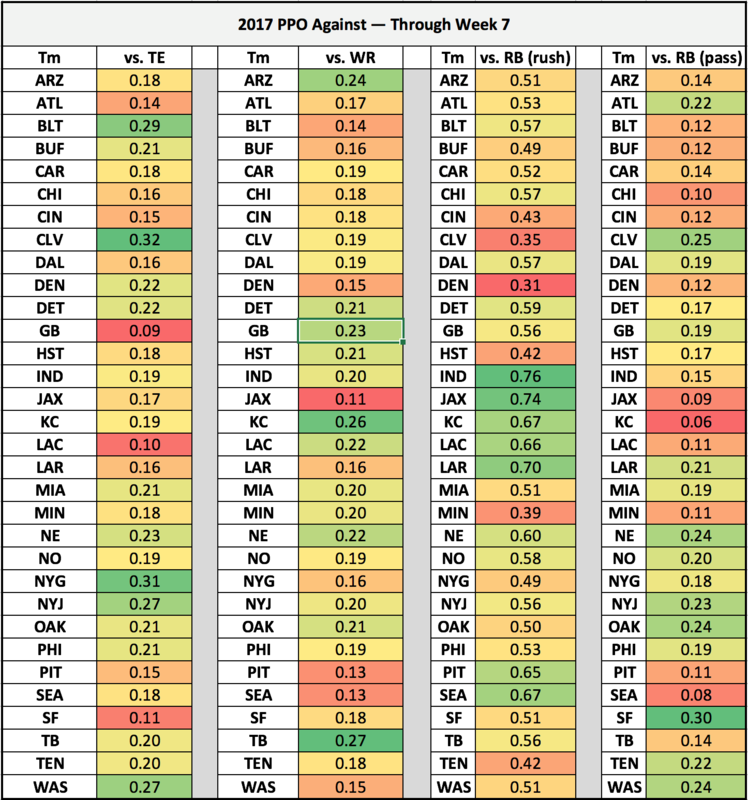 The Chargers have been friendly to running backs on the ground, giving up 0.66 PPO, sixth-most in the NFL. Dion Lewis continues to earn a larger role (attempts has gone 2-4-7-11-13 over the past five games), and this could be his true breakout week. Wendell Smallwood returned from injury in Week 7 and nearly matched LeGarrette Blount in snaps (25 vs. 24). He had eight rushing attempts and two receptions. He had six targets in his previous game. Smallwood has breakout potential in Week 8 against a 49ers squad that has given up the most PPO to running backs through the air. For real now, this is the week Demaryius Thomas breaks out. Emmanuel Sanders is likely to sit again, and Thomas draws the Chiefs, who have given up the second-most PPO to enemy receivers this year (0.26). It’s an Adam Thielen week. Stefon Diggs is still banged up (although it sounds like he will play), and the Vikings get the dream matchup against the Cleveland Browns, who have given up the most PPO to opposing receivers so far this year. If Diggs is a full-go, he’s primed to bounce back in a big way. too. A.J. Green could have a monster Week 8. The Colts have given up the 11th-most PPO to opposing receivers, and Green ranks sixth among all receivers in PPO scored. A bunch of people will want to play Chargers wideouts against the Patriots, but you can go the other way as well. The Chargers have given up the sixth-most PPO to opposing receivers, and this game sets up well for Brandin Cooks and Chris Hogan. Cooks (21st) and Hogan (23rd) both rank in the top 24 in terms of PPO scored among receivers. It’s hard to know which one will have the week, but don’t be surprised if one of these two ends as a top-five receiver in Week 8. The Browns are still last in the NFL in terms of PPO given up to tight ends. This week they get Kyle Rudolph, who ranks in the top 12 in terms of raw fantasy points scored among tight ends. Lock and load. Hunter Henry is a must-play against the Patriots, who have given up the sixth-most PPO to opposing tight ends on the year, including a touchdown in five of seven games. Henry ranks tied for sixth in PPO scored by tight ends this year. Old man Jason Witten ranks in the top 12 in every major tight end category, and he faces the Redskins in Week 8, who have given up the fourth-most PPO to the position. Contrary to the “he only does well in September” narrative, Witten has continued to produce deep into October, and he’ll put up big numbers again this weekend. This is a great spot for Austin Hooper, as he draws a Jets squad that has given up four touchdowns to opposing tight ends in the past three weeks. The Jets have ceded the fifth-most fantasy PPO to opposing tight ends on the year, and Hooper has been extremely efficient, catching 18 of 22 passes.